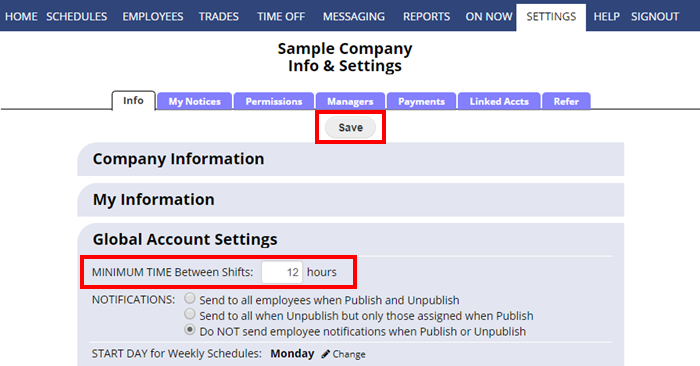 If you want AutoFill to give your employees a minimum time off between their shifts (so that shifts are not assigned to the same employee back to back), you can set the number of hours in the SETTINGS>Info page. This option is also used in the Shift Change window to show if assigning a shift will conflict and is included in the Analyze Schedule function. This is a company-wide setting. You can always manually assign shifts with less time between shifts. The next time you use AutoFill, it only assigns the same employee to shifts that are at least that number of hours apart. You can see if any manually assigned shift is in violation of this rule using the ANALYZE function on the Sortable List Schedule view.